The gated community of Carmel Valley Ranch includes single family homes and estates as well as townhomes and condos all within the confines of the Ranch, where stunning views, stellar golf and resort amenities create a lifestyle of luxury and sophisticated country living. Nestled in a valley surrounded by the majestic Santa Lucia mountains, this sprawling property has large estates and townhomes located along the fairways where you can relax on your deck and watch golfers tackle this challenging Pete Dye championship course. Elevated views of the course and valley can be quite spectacular and homes and condos in the hills above take advantage of their perch for a bird’s eye view. Many of the townhomes are quite spacious and have high end finishes, vaulted ceilings and 2 car garages. As you are traveling down scenic Highway 1 south you will reach Carmel Valley Road. The Ranch is located just over 6 miles inland. Carmel Valley Ranch is home to the Carmel Valley Ranch Resort which is part of the Joie de Vivre Hotel’s luxury portfolio and a project John Pritzker infused $30 million into with a transformative makeover and vision. Under this new ownership the property has blossomed into a 500 acre “playground” where guests can truly relax, leave their work at home and sink into the pleasures of eating wonderfully prepared local foods, taking an invigorating swim in one of the two resort pools, working out in the fitness center, golfing and spending time with family. While for most this experience is only a blissful couple of days, for those fortunate enough to call Carmel Valley Ranch their home, the lifestyle is year round. Club membership allows you first rate amenities and facilities for health of body and mind. Spa Aiyana offers pampering treatments and rejuvenating massage perfect for when you need to unwind and refocus. Homeowners pay monthly association dues that vary with each individual home. 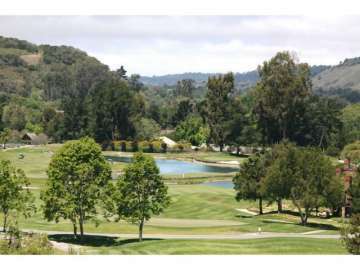 Click here to preview all Carmel Valley homes for sale in Carmel Valley Ranch. For all available Carmel Valley real estate, click here. 5 homes in this neighborhood sold in 2018. The most expensive home that sold, sold for 1.781 million for a 3 bedroom, 4 bathroom, contemporary style Carmel Valley Ranch estate with 3,236 SqFt on a 16,117 lot. The least expensive home sold for 805K for a 3 bedroom, 3 bathroom condominium with 2,200 SqFt of living space. 6 homes sold in this neighborhood in 2017. The most expensive home to sell was a 4 bedroom, 4.5 bathroom home with 3,003 SqFt of living space on a 4,548 SqFt lot that overlooks the 12th fairway. the least expensive home to sell was a 2 bedroom, 2 bathroom, 2-story townhouse with 1,805 SqFt of living space and sold for 939K. 3 homes sold in Carmel Valley Ranch in 2016, the most expensive home to sell was a 4 bedroom, 4.5 bathroom home with 4,317 SqFt of living space and fronts on the Carmel Valley Ranch and sold for 1.9 million. The least expensive home sold for 1.299 million for a 3 bedroom, 2.5 bathroom, 2,287 SqFt of living space with custom finishes home. 23 homes sold in the Carmel Valley Ranch neighborhood in 2015, the most expensive property to sell sold for 2.295 million. This particular residence had two homes on about a half acre lot, with 6,052 SqFt of combined living space. The least expensive home sold for 800K and was a 3 bedroom, 3 bathroom ranch style home with 2,456 SqFt of living space on a .39 acre lot. There were 12 homes that sold in this neighborhood in 2014. The most expensive sold for 1.4 million and was a 3,854 SqFt home on 5,750 SqFt of land, while the least expensive was a townhouse that sold for $710K and was a 1,860 SqFt home on 2,273 SqFt of land. In 2013, the most expensive home sold in the neighborhood was a 5,200 SqFt home on over 57 acres of land, and sold for 4.05 million, while the least expensive home sold for 660K and was a 2,004 SqFt home located on 968 SqFt of land. In 2012, the most expensive home sold in Carmel Valley Ranch sold for 1.225 million. This 3 bedroom 3 bath home had 3,641 SqFt of living space and had a lot size of 3,920 SqFt. This home had a terrace opening up to beautiful elevated golf course vistas and a floorplan perfect for entertaining. The least expensive home sold in 2012 came in at 580K and was a 1,935 SqFt townhome with remodeling potential ideal for condo living or vacation home. With an average of more than 300 days of sunshine a year, Carmel Valley is drenched in sun with fresh ocean breezes coming in from the Pacific. Outdoor enthusiasts will love exploring the hundreds of miles of trails for hiking and biking. Tennis and golf enthusiasts will enjoy the superb golfing at the Ranch as well as the world renowned courses a drive away in Pebble Beach. The Ranch also has world class tennis facilities managed by Peter Burwash International including 9 courts. Carmel Valley Ranch provides a sanctuary from the hustle and bustle but is still easily accessible and maintains excellent proximity to Carmel-by-the-Sea, Pebble Beach, and Monterey. Your everyday errands are conveniently taken care of by the nearby shopping centers where you can find brand name grocery chains as well as neighborhood retailers. For entertaining friends and family, your Carmel Valley Ranch home is unrivaled. Your guests will be amazed at the beauty of your oak studded community, with its vineyard and lavender fields and lush green golf course views. And with the abundance of activities and outdoor adventures to take advantage of you will be creating life long memories. To live in Carmel Valley Ranch is to experience luxury resort living in a breathtakingly beautiful valley setting where every day can feel like an escape.